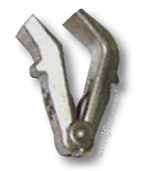 anvilfire VISE (Vice) Gallery : Images of bench or screw vises of many types. Blacksmithing and Metalworking Tools Historical Preservation. Somewhere . . over the rainbow . . . We're not in Kansas anymore Toto. . . 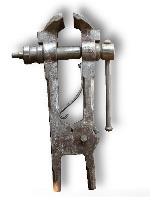 The screw vise is probably the world's most important invention yet it goes so far back in time that it cannot be attributed to any inventor, not DaVinci, not Aristotle (both advocates of screws). The first screw vises were made entirely of wood and the screws were cut primarily by hand or on primitive lathes from hand drawn layouts. The expanded use of the screw vise follows advances in screw cutting lathes and was probably one of the primary driving forces for the need for screw cutting machinery. For over three centuries turned metal screws were used with fabricated nuts made from coils of small bar brazed into a tube. The value of a vise being so great that they would not wait for the manufacturing technology to catch up. 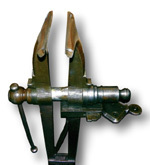 It was not until the 1860's that vise nuts (boxes) had machined threads. The screw vice is one of the most used tools in any kind of workshop. Vises are used by watchmakers, jewelers, sculptors, furniture makers, machinists, blacksmiths and many others. In modern machine shops where very little is done by hand most machines have dedicated specialized work holding vises. 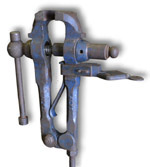 In the lathe a derivation of the vise was developed for holding round work, 3 and 4 jaw chucks. In the blacksmith shop one often thinks of the anvil as being the most important tool. But the blacksmith spends as much or more time at the vise, sawing, filing, grinding, welding and chisling. In a shop with one anvil you may see three or more vises. The hand held grinder has largely replaced filing but the vise is still used to hold the work being ground. Today, with most bench vise manufacturing moving overseas where they use poor quality castings and cheapened manufacturing methods there has been a resurgence in interest into old well made American and European Vises. Bench vises that you could not give away a decade ago are now selling for nearly new prices. More Vise Stuff, Shop value, setup, accessory tooling, use guidelines, maintenance. NEW! Catalog of Vise Catalogue Pages A lifetime collection of old catalogs and books. 72 historical pages featuring vises and metalsmithing tools. BLACKSMITH LEG or POST VISES English and American Leg Vises, a standard for hundreds of years. Our original Vises article . Includes weight and size table with proportions graphic, types of forged mounting bracket, how they are made and how best mounted. 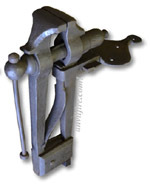 . .
Columbian D33½ Bench Vise A standard in many shops for decades. A large industrial duty vise on heavy stand. Found in an industrial blacksmith shop. Made by Western Tool & Mfg. Co. for auto garage use. An emerging market in the 1920's. From Steve Prillwitz of Matchless Antiques. 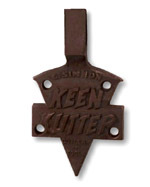 A rare and unusual blacksmiths leg vise with a Keen-Kutter logo bench plate. 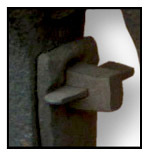 Woodworking Vise Installation and improvements. From the guru's wood working bench project. While these look like an English Vise they are very different. Large 6" x 6-3/4" machine vise. Previously listed as a 1460. Now includes parts diagram. Features that made them the best. . .
From Steve Prillwitz of Matchless Antiques. He says, "Its the largest I've seen". Tom Davis Collection, includes catalog image. Prentiss No. 58 Chipping Vise on Stand Also known as the Prentiss "Bull Dog" Vise. 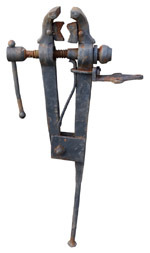 Antique Old English Leg Vise, circa 1800. Brooks Blacksmiths Leg Vise, circa 1970. An auxilliary vice to be held in a larger vise. Greenfield Type Heading Caulking Vise. Wells Bros. and Wiley & Russell specialty foot operated vises for the blacksmith shop. Fisher Double Screw Parallel Jaw Blacksmiths Leg Vise. A rare vise, an advertisement and some stories. Vise as art or vise art? Columbian Red Arrow Home Shop Vise with blue marble paint. Model 63½ catalog page from 1949. Beautiful photos of a NOS (New Old Stock) vise. Plus Dawn Tool Co. the designers of this vise. A great photo! A great old tool! The heaviest duty of vises. Patented 1896. Can be reversed to close on either side of fixed jaw. 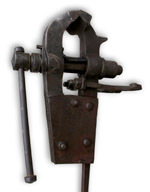 Emmert Universal Pattern Makers' and Wood Workers' Vise. Patented 1891, 1905. Tilts and rotates, holds tapers. Morgan Milwaukee 8 inch Chipping Vise. Plus a shop still life with the Morgan, a Wilton "bullet" and a Jewelers' anvil. 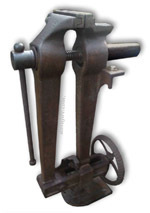 A beautiful specialty leg vise. You rarely see one of these much less one in so nice a condition. From the collection of Emerald Koch, BlacksmithParadise.com. Includes parts diagram and cutaway view. Links to other Wilton Vises. From the Blacksmith Tool Collection of Ted Mays. Another fine tool from Ken Kohut. Vise Safety Cartoon By The Great Nippolini. Those strange Anvil Shaped Objects that were also vises and other things. . ..
Champion Blower and Forge Combination Repair Outfit No. 30 or Six-in-One with forge, anvil, vise, drill and grinder. Includes full catalog page and links to similar items. The King of machine tools - an absolute necessity to make or repair screw vises. Should you have one in your shop? 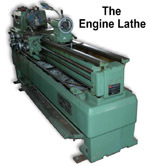 Buying old lathes, chucks and tooling. The "other" blacksmiths "anvil". collection of over 50 swage block images plus articles on the history, design and use of swageblocks. Over 3000 years of blocks. Another web gallery by Jock Dempsey the anvilfire guru. Anvil photos by the guru and others collected over a decade. Includes foundry patterns, catalog page and more. . .